Premium bundle consists of a BerkeyTM water purification system complete with 2 BB9 Black Elements, 2 PF-2 White Fluoride Filters and Naples Naturals® reusable water bottle. Water never tasted so good! Now you can take your Pure Berkey water with you with the include lightweight reusable water bottle. Perfect for a walk in town, a trip to the art fair or music fest... wherever you are you'll have your pure Berkey water. Handy mini-caribiner to securely attach your bottle while you're out and about! 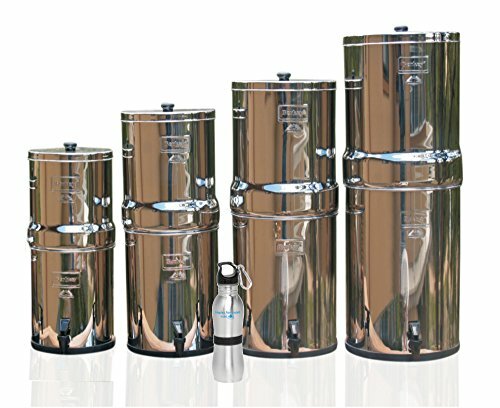 The versatile Berkey water purification filtration system is comes in multiple sizes to fit singles through medium-large groups at home, churches, hospitals, for outdoor activities or during unexpected emergencies. This powerful system purifies treated water and untreated raw water from sources such as as lakes, streams, stagnant ponds and other untreated sources. Perfect for everyday use and a must in hostile environments or disasters where electricity or treated water may not be available. The Berkey water filtration system removes pathogenic bacteria, cysts and parasites and extracts harmful chemicals such as herbicides, pesticides, VOCs, organic solvents, radon 222 and trihalomethanes. It also reduces nitrates, nitrites and unhealthy minerals such as lead and mercury. This system is so powerful it can remove food coloring from water without removing the beneficial minerals your body needs. Virtually no other system can duplicate this performance.